Fire Consumes Woman’s Makeshift Shelter on 14th St.
A blaze of unknown origin on Tuesday afternoon consumed the plywood box home of a woman on 14th Street, causing no injuries but leaving the woman without shelter and many who live in an encampment around the corner worried about the aftermath. The fire started sometime around 3:30 p.m. in a sidewalk encampment behind Office Max at 1750 Harrison St. and across the street from Rainbow Grocery’s parking lot at 50 14th St., but was extinguished within minutes, according to Chanses Gomez, a Rainbow security guard patrolling the parking lot. Gomez said she noticed the fire and immediately called the Fire Department. San Francisco Fire officials did not immediately respond to requests for comments, but a woman who gave her name as “Nikki” and lives in an encampment of about five or so tents on Trainor Street around the corner from the scene of the blaze, said that firefighters had told her that a stove inside of the box shelter had been left burning and unattended. The woman living in the makeshift shelter was not present during the fire and is presumably still unaware of the blaze. Nikki said that she initially noticed a plume of smoke and a “burning smell,” prompting her to leave her tent to see what was going on. Upon turning the corner, she said she saw flames consuming the sidewalk about half a block where the box had stood earlier in the afternoon, quickly growing in size. “The fire went as big as that [street] lamp,” said Nikki. 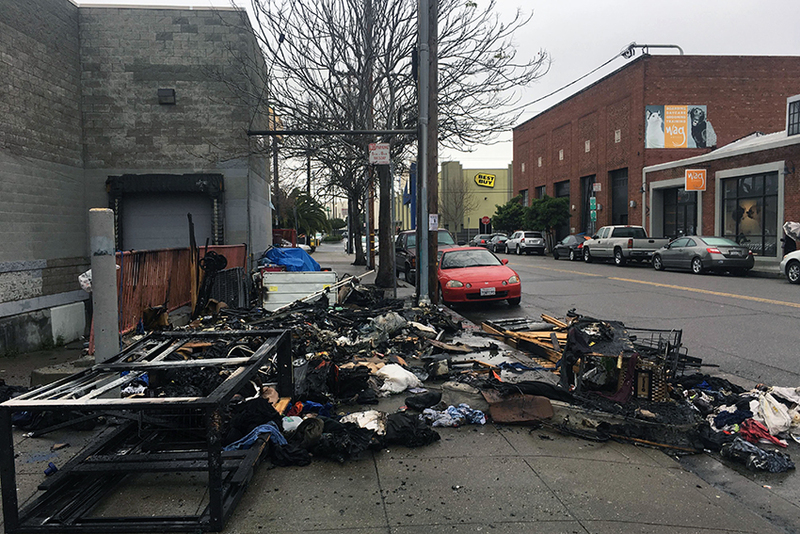 After it was put out, Nikki said, “someone looked inside and said there was a stove burning.” She and other Trainor Street campers initially ran to help salvage what they could – but most of the woman’s belongings except for a Costco shopping cart had been charred by the fire. The block between Harrison and Folsom streets on 14th Street hosted a number of tents, all of which have moved on in recent months, said Nikki. Only the woman who lived in the now destroyed box remained there. Residents of the Trainor Street encampment around the corner have received a verbal warning by police that their encampment will be cleared on February 14, but Nikki said that because of the fire, she now fears that she could be asked to leave sooner. “If something happens, I’m ready, I have my stuff ready to go,” said Nikki, who shares her tent with five cats. The afternoon blaze left the Trainor Streets visibly shaken – several campers there began arguing about cleaning up their own encampment moments after the fire was extinguished and the fire engines had departed. Damn fire department not enforcing sprinklers rules in all the homes!!! Would have prevented this one.